Christmas is a time of tradition, of course, and long-term readers will know that one of my few festive habits is to read ‘The Adventure of the Blue Carbuncle’. The only explicitly Yule-ish Sherlock Holmes story, the ‘Blue Carbuncle’ focuses on forgiveness and food – it feels to me, in large part because of repetition, to embody Christmas. Reading the story gives me the same feeling some will get from their favourite seasonal song, or from a particular drink or location. To what end, however, do we indulge in the Christmas spirit? Why do we have these traditions, these triggers, to slip us into the right gear when otherwise we might roll into the holiday period feeling just as we do for the rest of the year? What’s Christmas for, precisely? For many, the answer is family – the excuse, as the Petersons do in the story, to gather together and enjoy time without interruption (except, of course, for the sudden appearance of a precious stone at the dinner table). For others, and curiously none of these appear in the Holmes story, Christmas is for children. For Watson, Christmas is a time to visit old friends – at the time of ‘Blue Carbuncle’, he no longer lives at 221B Baker Street, yet he makes a visit on the second morning after Christmas. 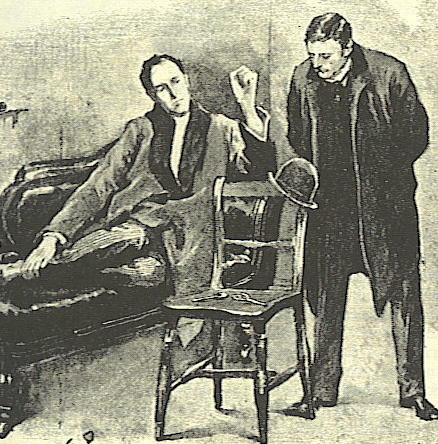 He closes the story by inviting Watson to eat a Christmas supper with him. Holmes, in other words, sees Christmas as caesura: he shuts the doors and, barring people who come to him, he spends it in quiet contemplation. In my case, festive cues help me similarly switch off, and consider, like Holmes, a smaller – but no less important – set of problems. Perhaps not coincidentally, my introduction to Sherlock Holmes was as a result of Quiet Time. This was the name given to an hour of afternoon’s silent private study that was introduced to the class of final-year infants students to which I belonged by a wonderful American exchange teacher. Her encouragement of individuality and creativity was a huge influence on me – and I still daily enjoy its benefits. My choice of activity during Quiet Time? Holmesiana: reading adapted stories, drawing pictures, writing what we’d now call fanfiction. Quiet Time gave me the opportunity to explore not just a passion, but the storytelling principles behind the tales I was beginning to love. It wasn’t an opportunity I’d have been given without that stateside innovation, since in place of Miss Ingram’s gentle private contemplation would have been a prescribed hour of … something I would now be unlikely, in all probability, to remember. In other words, a period of peace was infinitely more productive than the alternative.